‘Co-Parenting in a Box’ is one of hundreds of resources about the ideal solution for all families who separate. That solution is constructive collaboration not high conflict legal dispute. But of course we know that in some families the ideal just ain’t real. 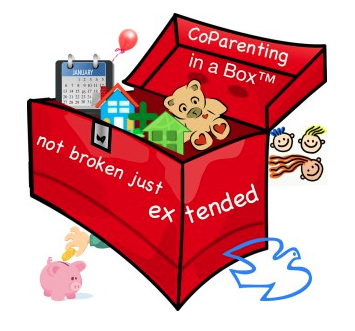 CoParenting in a Box is the creation of UK co-parent of three Suzy Miller – a champion of non-adversarial routes through family change alongside educating parents on how to be better at collaborating. Suzy’s wider work can be seen on the ‘SOS’ or Starting Over Show website. Here Suzy talks about the Box, which is mostly a collection of video resources. You can get a free information pack too. The Box of resources is to encourage and help separating parents become a successful ‘extended family’ rather than just ‘a broken family’. Rosalind Sedacca of the Child-Centered Divorce Network endorses the Box along with a number of other respected organisations. We need to underline this collaborative theme here for balance. This blog is often more about situations where one or both parents cannot or will not do collaboration themselves without imposed help and intervention … always remembering that other agencies too may actively promote their conflict. Although Parental Alienation (PA) is typically where parents cannot collaborate, Co-Parenting in a Box does start with PA. To celebrate the recent PA Day, they used the voice of a mother to describe her and her child’s alienation experiences. Click to that page or here to watch that video. Note again – for those who presume PA is fixed to one gender pattern – this is the voice of a real mother and her child facing alienation. Many of the resources that promote collaborative solutions tend to steer clear of mentioning PA. We think of PA as always being no contact with the rejected parent. Often voluntary collaboration is not going to happen. But PA can continue just as powerfully even when children do have regular contact with a rejected parent. Anyway, knowing how PA looks is important information and motivation to work at collaboration before it gets out of hand. So that’s what makes this ‘box’ special. One reason for ignoring alienation is that people think the negative word might raise conflict and discourage collaboration. 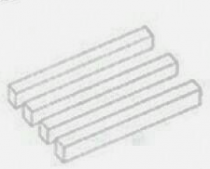 But that well-intentioned ignorance often means the denial that negative things can and do happen. Well-meaning people hope that idealism and not talking about nasty things will make them go away. But not talking about the nasty things does not recognise the real harm and risks that face the children. Denying it unhelpfully implies a kind of blame on parents who find it hard to collaborate. Remember that in many cases, it only takes one parent to make it impossible for both to collaborate. The hurt and anger in separating is so strong for some that they cannot collaborate even though they know it’s best for their children. The outcome of well-intended but ignorant promotion of collaboration can be less than helpful if the idealism makes parents feel undue blame and even more of a failure – and these are the parents that the advice is most aimed at. So the way that the Box leads off with a pack that looks at Parental Alienation makes this unusual and worth talking about here. Doing your homework. What are parental rights and how do we ‘share’ the children? Essential parenting resources – people and products. Separated father John Bacchus, Inspector George Gently’s side-kick, is hurt and angry at his ex-wife’s use of her resident parental power – and his not-so-gentle personality and behaviour as a handy reason – to keep his contact with his young daughter to a minimum. Father and daughter clearly enjoy a good and safe relationship. The monthly contact is shaped by the adults’ relationship, not the child’s wishes and best interests. George Gently gently engineers a happier ending for them although it’s far from ‘shared parenting’. It’s a good crime plot as well. Both plots are recommended. Until this episode comes round again on the telly in your country of residence, you need to buy the DVD. Or you could watch using unofficial online resources that Inspector Gently would not approve of … had he any idea in 1969 that the internet could happen! “The outcome of well-intended but ignorant promotion of collaboration can be less than helpful if the idealism makes parents feel undue blame and even more of a failure ..” – couldn’t agree more. However, have you noticed how many parents are utterly unaware that mediation can be conducted as ‘shuttle’ mediation – so with the couple in separate rooms? Or even via Skype (which in some cases of Domestic Abuse this is a far better alternative to having an abuser ex self-representing in court and using that as another platform to ‘control’? Let people have the facts and the options – and trust them to make the best decisions for their own circumstances and situations. I am not too experienced at the frontline, but there are a number of ignorances that stagger me as I see what does and does not go on in practice and in the heads of those providing services! I have always thought that shuttle diplomacy (aka ordinary arbitration?!) between family lawyers / mediators is an obvious and relatively cheap early way to go.